We are your African Safari ground crew here in the States. We have been traveling to Africa since 1988, many times with Paul Oliver and several times on our own, with camping gear and a rented Land Rover. 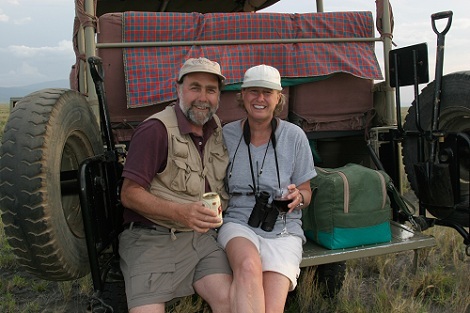 Our safaris have taken us to Kenya and Uganda but our true love is for Tanzania. We've camped on the floor of the Ngorongoro Crater (no longer allowed) and by the rushing waters of the Nile at Murchison Falls in Uganda. We've run with the hunter/gatherer Hadza of Lake Eyasi. We've been stranded in Bukoba on the far side of Lake Victoria. We've been chased by an elephant in the Silale Swamp of Tarangire National Park. We've spent many, many evenings lying in our tent, in the Serengeti, listening to the roar of lions, and the laughs of hyena. With all that Tanzania has to offer we are drawn back, time and time again. There is always something new and glorious to experience and explore and each and every African Safari is unique. The animals are our passion, the people and culture amazing, the scenery like no other. When we are there, we feel like we are "home". We will devote ourselves to being completely accessible to you. We will guide you through everything you need to know so you are well prepared for your safari. We do our best to have the group meet at our home here in Northeastern Connecticut for a fun Safari Night of questions, pictures, slideshows, and dinner. If that is not feasible logistically, we will be readily available for all emails and telephone conversations. Our goal is to create the trip of a lifetime for you. For photos of some of our trips go here. For some sample itineraries go here. To follow our Facebook page go here.